Welcome back to the blog! Today we are super excited to get into some geode themed DIYs! What’s a geode you ask? A geode is a rock that has a crystal-filled cavity in it! People usually cut them open or slice them to get a cool layered crystal effect. Today we’re going to do three DIYs that are inspired by these super cool rocks! Start with a stack of paper in the colour scheme you would like to use. I’m going for a nice pink, grey and white combo in a thick card stock. Cut down all of the card stock to fit on your frame if it doesn't already. Sketch out your rough geode shape outline with a pencil onto the top layer and cut it out using an X-acto knife. With your next layer underneath, cut out a slightly smaller shape than your top layer. Continue this process for the rest of your geode shapes getting smaller and smaller. It’s also fun to slightly alter the shapes as you get smaller. When you have all of your shapes cut, you can go back in with some gold paint to add detail around the edges of some shapes. I outlined a few layers than filled in the middle with gold. When I had all of my layers together, I thought the top piece of white needed a little something. With some watercolours, I added in some pink tones. When you’re happy with the look of your layers, the next step is to space out your cardstock to give your geode art a 3D effect. Using craft foam cut into squares, add 3 or 4 to each layer, alternating the areas you’re placing them in for even coverage. For your last step you will need a deep picture frame or small shadow box. I picked up this frame from the thrift store. Put your geode art into the frame and you’re done! This is such an easy DIY and super easy to make your own! You can pick any colour scheme to match a room that’s missing an art element. 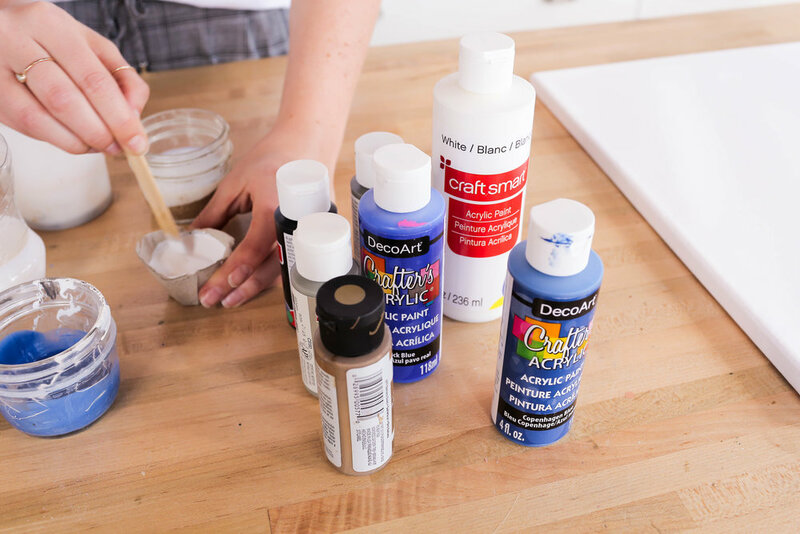 For this DIY you’ll need a canvas in the size of your choice, an assortment of paints, a variety of cups which we found in our recycling and a pouring medium. I’m using the brand Liquitex linked here. Following the instructions on your bottle, add your pouring medium into your different paints. Mine is a 1 to 1 ratio. I’m using a mixture of blues, greys, black, gold and white. I made two whites, one for the base of my canvas and the second to make a speckled mixture. I’m going to add dots of black, blue and grey which will create a marbled effect when you pour it. Don’t mix these together, leave them as dots! For your set up, you’ll need something to protect your surface and either cups or cans to prop up your canvas. Start by covering your canvas with a thick layer of white, this will help everything to spread later. Then we get to pouring. I’m starting with a generous amount of paint, followed by a different colour, and another. When you are pouring the speckled, just pour it as you would any of the other colours. As a general rule, I made the first pours a little larger than the inside pours. Once you’ve created 10 or so rings it’s time to start tilting. The goal here is to make this circle look like ¼ of a geode slice. Tilt your canvas slowly in every direction to spread your rings. Go slowly so that the inside rings don’t overtake your outside rings. Repeat this but then focus towards one of the corners, moving the middle of your geode so that it lands in the corner. Leave on those cans/ cups to dry and periodically wipe to avoid drips. For the next DIY we’re making a geode out of yarn! So many of you told us in the comments of our rug video that we should try latch hooking, so that’s how we’re going to make this one. To start you’ll need some of this rug canvas used for latch hooking, it can be found at the craft store and we’ve linked some below. Sketch out the outline of your geode shape onto your base and add in some rings to the geode as well. For the yarn, I’m going to be using these colours. To save yourself some time pre cut a bunch of 2 inch pieces of all your colours. Now on to actually latch hook. With your latch hook open, go under a line in your grid so the handle is on the top. Take a piece of yarn and wrap it under the handle, slide until it’s right under the latch and loop it over into the inside of the latch. Pull your hook closed and out of the grid. There are lots of great tutorials on how to latch hook online if you need more help. I started with my inner section, filling it in with this white flecked yarn. Next i made a loop around this inner loop with plain white. Continue filling in all your rings with different coloured yarn to complete the geode. Next you can give your rings a haircut. Experiment with having the different layers at different lengths as well. Now you can cut off any of the extra grid around the sides. It could also be really fun to add some crystal charms to the centre of the geode as well! Latch hooking is super easy to do once you get the hang of it but it does take some time, much like our rug did which turned out so amazing, linked here! That’s it! We love how these three turned out. If you make any of these DIYs, tag us on instagram using the #SorryGirlsSquad hashtag. Check out the video below!